For those thinking about trying something new to burn off the Christmas calories, a new roller skating course is coming to Cardiff. 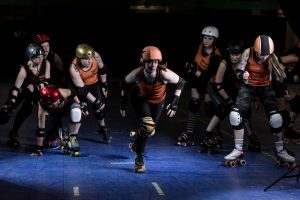 The Tiger Bay Brawlers, Cardiff’s roller derby team, are launching a new course to teach skaters to be eight-wheel whizzes this January. The structured course will teach all the basics of roller skating including how to fall safely, different stops and even how to skate backwards. Skaters can complete the eight-week course as many times as they like, with the content becoming more advanced each time. Twice a year the course will take a break to instead teach skaters how to play roller derby. Roller derby is a fast-paced contact sport, where points are scored by the jammer, who must lap players of the opposing team. Pip Gray, an A team player for the Brawlers and member of the Team Wales World Cup squad, said: “We’re really excited to get the new training course underway and hope to see lots of new faces in the new year. Sessions will run on Thursdays at 6-7:30 and Sundays from 12-1. The cost of the course is £40. All sessions are at Cardiff Central Youth Club.